Music production and performance system for Windows, Mac and Linux. 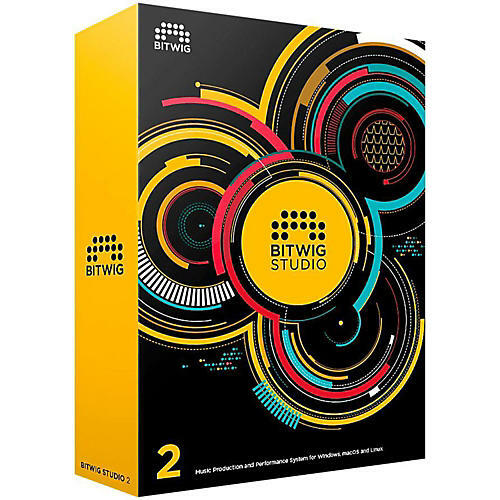 Bitwig Studio 2 is here and with it comes a refreshing round of updates including a re-conceptualized modulation system with 25 brand new Modulators, numerous device updates, 17 entirely new devices, better hardware integration with improved MIDI handling, VST3 support, and a lot more. With cutting edge technologies like plug-in crash protection and a highly flexible user interface, alongside a lightning fast workflow experience for keyboard, mouse and touch screens, Bitwig Studio has attracted a large and steadily growing user base all over the world,a nd this latest version introduces a whole new set of powerful features. Each device in Bitwig Studio 2 (internal devices and external plug-ins) have modulation slots where you can load individual modulators. Bitwig Studio 2 comes with 24 brand new modulators; from standard modulators like envelopes and LFOs - to more unique modulator types like Random, Select-4 and Math. An unlimited number of modulators can be added to a device by simply clicking an empty Modulator slot and choosing a specific Modulator from the pop-up browser. Assign the modulator to any number of parameters, with ease and flexibility. Modulators can also be interconnected for truly dynamic and expressive sound design possibilities. When using internal Bitwig instruments, many modulators can be set to polyphonic mode - enabling per-voice modulation - something previously only seen in closed systems. Apart from totally re-conceptualizing the modulation system and introducing an entire new class of Modulator devices, the Bitwig team is also expanding the standard device collection. Here's a list of the new additions: Spectrum Analyzer, Dual Pan, DC Offset, Phaser, Pitch Shifter, Treemonster , Multi-Note, Note Length, Note Echo, Note Latch, Note Velocity and Note Harmonizer. The team has worked hard under the hood to revamp MIDI handling in Bitwig Studio; improving sync and note timing. They're also introducing a set of devices that will allow you to seamlessly integrate hardware machines into your workflow via MIDI and CV/Gate. There have been a lot of enhancements to the existing devices inside Bitwig, improving both sound quality and usability. Several devices now include a spectrum analyzer and dynamic display panels. Many devices have been re-organized, re-designed with new features. There's also improved visualization of parameters, movement and signal flow. Since Bitwig Studio first came out, Polysynth has been their go-to synth for musicians and sound designers. With Bitwig Studio 2, Polysynth's feature set has been expanded even further, adding several oscillator mix and filter waveshaping modes. These new modes open up new possibilities for sound exploration; adding complex overtones and frequency modulation options to your sound palette. Also with improved unison capabilities you can now control the stereo width of the oscillators - and place them individually in the stereo field. With the new modulation system there's no need for the three LFOs or expression choosers, you can simply add all the modulators you like. Now every device now has a Remote Controls panel, where you can assign remote control access to any parameter in the device (or nested in the device chain). Navigate existing pages or freely set up your own, using different control elements (e.g. knobs, buttons, choosers). Mappings can now be saved with presets or devices, allowing on-the-fly access to your favorite parameters directly from your hardware controller, when browsing through your library or swapping between devices and tracks. This powerful and flexible new feature refines and improves the Device Mappings and Macro pages from Bitwig Studio 1. You can now create fades and crossfades for audio clips in the arranger timeline or audio editor. Additionally, you can create fades for audio events inside clips - for truly fast yet flexible editing. Naturally, the curve slopes of all fades can be adjusted. Easily edit fades by hovering the mouse cursor over clip or event boundaries, and then drag the fade handle when it appears. Crossfades are automatically created when you move clips so they overlap. The Dashboard, likely the first new feature you'll bump into, handles many tasks that were previously available only in menus and other windows - such as locating and opening projects, configuring settings, installing packages and accessing help resources. The Dashboard allows a more sophisticated and user-friendly approach, informed by modern software design paradigms. Also most configuration settings have been consolidated and included under the Settings tab in the Dashboard. Bitwig Studio 2 now features a context-aware menu system to keep you focused on the task at hand. Depending on your selection, different menus and options will be shown. For instance, when selecting a track, a menu will be shown with all available related actions. To speed up your workflow even further, you can pin actions so they are always visible in the menu bar. All of the context menus have been reworked as well, to give you quicker access to your favorite commands. All commands are now collected in the menus, and removed from the Inspector to make it less cluttered visually.